The last thing I needed was another horse. 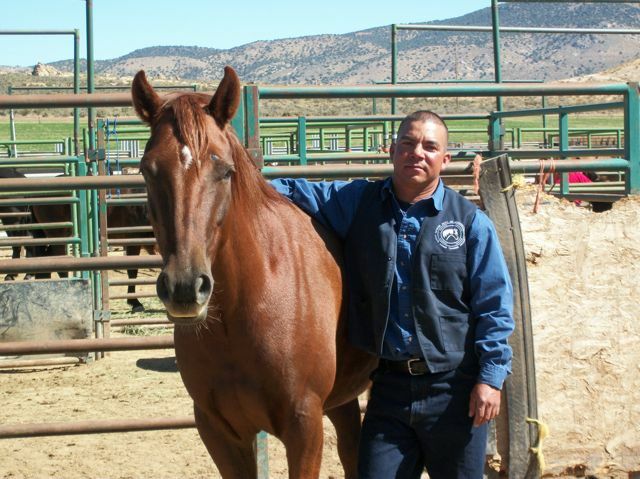 Today I went to the Prisoner Trained Mustang Auction in Carson City, Nevada. If you’d like to read my original post about it, click here. Anyway, we had some friends visiting this weekend so all 8 of us left the house at 6:30 this morning for our trek out East. We hit the road (and a Starbucks) at 6:45 ish and headed for the Correctional Institution in Carson City. I had been to two auctions before and reported on them all… From my perspective, to have a Mustang that is handled 8 hours a day, 5 days a week for 4 months – as these Prisoner Trained Mustangs are – is a GREAT thing. I think the program is a good one. 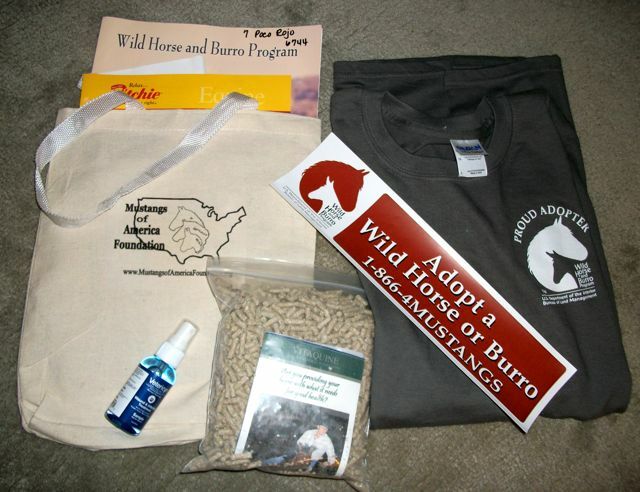 Especially since the Mustangs in general have very little opportunity to become solid citizens when they are older than babies… With 30,000 adult Mustangs in pens, it is important to have a concentrated training program available for the Mustang and potential adopters. But this auction was different. Previously, the auctions I attended were in Reno at the Expo Center, not the prison. 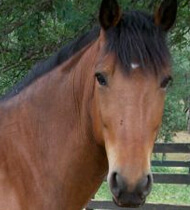 All the horses sold and most sold for at least $800 – $2000. I don’t know if it was because we were in the actual prison or what… but less people showed. And even though the BLM gave out the same number of bidder paddles, not many people were actually bidding. There wasn’t a snap, crackle and pop in the air. I hope the lull was just due to the recent storm or maybe some other unforeseen issues – because the horses were really fine. I mean, of the three auctions I’ve attended, this one was the best. Really. The horses were all awesome. OK, so the first horse came up for bid and no one bid. Well, I could maybe see why since that horse was a bit skitty. Then, the second horse came up. No one bid. OY. I was upset. These horses were NICE! All of them walked, trotted, cantered, side passed, lifted their feet… they did it all! The third horse sold for an insanely low amount. Now I was very upset. I mean, it was good for the buyer to win a great horse for little money, but I want the program to continue and if it has no buyers, then it won’t. The next great horse went for a pittance. Ugh. When Poco Rojo came into the ring, Hubby and I recognized his trainer as one of the best from the last few auctions. We knew that Poco Rojo would have been worked very well… and he was. Poco went through all of his paces happily. He walked, trotted, cantered… Jesus (the trainer) slid off of his rump and walked underneath Rojo… he rode without a bridle. They played with a huge ball. 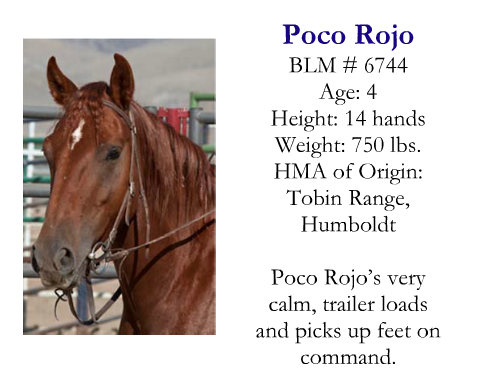 Poco Rojo did it all – AND, he was little. I like the little ones. When it was time to ‘find him a home’, no one bid. I was irate. What??!! So, I threw up my paddle. Another guy bid against me. So, I bid against him. We went back and forth to get the bid up to $1000. HE had the $1000 bid. 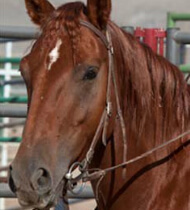 Well, I was so into the excitement of finally having a highish bid – I felt this guy would go higher on such a nice horse. So, I bid again. He was just my size and very well trained! I was wrong about the stranger bidding next to me. $1000 seemed to have been his limit. As if in a cone of silence, I listened to only the auctioneer as he kept asking for $1200… in his incredibly fast oration, he drove into my consciousness that no one else was responding to him and that I could possibly spend $1100 on a horse I had never intended to purchase. $1200? Is there $1200…? All in, all done… SOLD for $1100. I was in shock. OMG! The crowd erupted! They all knew he was a great horse at an incredible price. I felt a little sick and choked back a tear. Hubby probably could not have said anything better. It was the exact thing I needed to hear in that moment. And now he was mine. Yikes! I hadn't even met him! For the rest of the auction, I was in a daze. I noted all the prices for the remaining horses (4 didn’t sell – a first. Very sad) but all I could think about was getting into Rojo’s pen and meeting him face to face. I stood up to see where he had gone but I couldn’t find him. Music to my ears however, I think all of the horses were equally wonderful in unique ways (which I will write about later). And, in addition to my purchase, I received a goodie bag! Immediately after paying, I went on a hunt for Rojo. I couldn’t find him or any of the horses. But, I did find an inmate who was holding Farm Boy for his new owner. I asked where I might find Rojo. He told me to go through another set of gates and I would find him. It was a bit scary to wander further into the yard. But, I did and realized that all the new buyers were now in the holding pens with their new mounts. Jesus came up to me and asked if I had won his horse. I said that I had. He shook my hand. Like a gentleman, Jesus showed me everything he could in the ’15 minute tour’. He told me how Rojo likes to be greeted, how to make sure he is listening, how Jesus trains him and then… Jesus introduced me to Rojo. Rojo in his pen at the prison with his trainer, Jesus. I decided to assuage my fears and greet Rojo as if it was ‘meant to be’. I decided to welcome him as if Aladdin had directed me. I opened my arms and showed him my heart. He smells as sweet as he is. 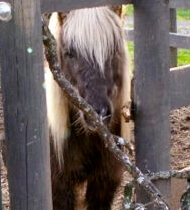 –I cannot wait to go back and pick him up this week! Me and my new boy. 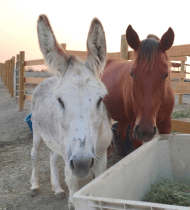 Results of the 10/8 Prisoner Trained Mustang Adoption in Carson City! Oh, Dawn, I too have tears in my eyes! I lost it when your husband made his very supportive comment at the auction, and just continued on from there! You and Red make a lovely couple! I have read your next post about bringing him home, too, and am delighted to see how well he has settled in all ready, even if the trip was a little hair raising for you! LOL! His gorgeous coat is very red, isn’t it? 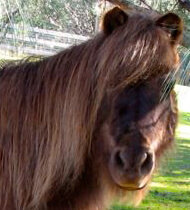 It looks almost as if he’s dyed his mane! 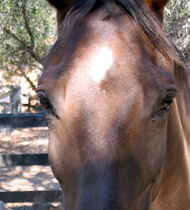 Kitty Bo, I know you mean well, but Dawn is a very experienced horsewoman, and Rojos is NOT her first kick at the can. I’m sure you didn’t mean it, but your post came across as a little condescending to me. You needn’t worry about her skills, or her knowledge level. Aw, he’s gorgeous! I hope to meet him too! I had tears in my eyes after reading this post. So happy for you, and for Poco. Wish I didn’t live sooooo far away, I’d love to have a Mustang. Always feel that it’s very hard on them to make a trip like the one it would take to get one home to me :(. 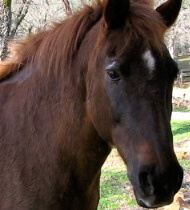 I am so afraid of the day that I will lose my current horse. 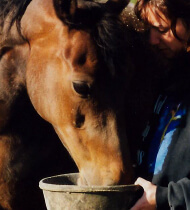 He is the horse that has stolen my heart completely and we have that special bond like you had with Aladdin. I’ve told my husband that he’ll have to put ME down when Leo goes!! This story gives me hope. Can’t wait to hear about your trip and Poco’s introduction to the rest of the “gang”. Dawn, I am thrilled for you! I actually had tears in my eyes reading your post. 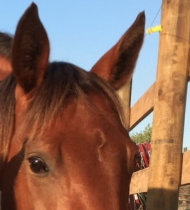 I had read your initial post about these horses that were going to be auctioned and always think “If I was able to….” But sadly we can’t accommodate another horse yet. And what wonderful horses they were! But I loved Poco Rojo the best as well and I’m so glad that you listened to your heart. I also look forward to hearing about your adventures with your Mustang. 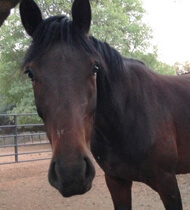 I wish more people would adopt Mustangs….they are incredible horses, a breed apart from the others. Congratulations! Makes me wish I lived in America, these auctions sound like a great place to get well-trained horses for not a lot of money. I agree with Cynthia Buczkowske. 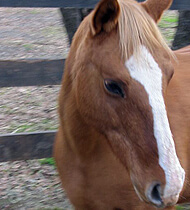 The horse that’s gone on will often direct the right, new horse to his owner. I’ve seen it first hand. Don’t fear. Go with it in confidence. Very pleased for the both of you. 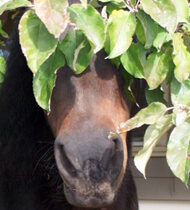 I am a firm believer a horse who has gone on to wait for their person at the Rainbow Bridge will send another horse to help your heart heal. Your “Little Red” was Aladdin’s gift to you because he would not want you to be sad. So love your Little Red with an open heart without reservation. He was meant to be. I’m so happy for you Dawn. You’ve done what I wish I could do. Looking forward to hearing about the adventures of RoJo and Dawn. Jesus has a heart of gold for the horses. Good job Jesus. LOVE! 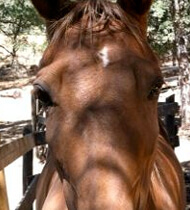 Looking forward to the further adventures of Dawn & Rojo and the rest of the herd! How exciting!!! :D Congrats to you and Rojo! 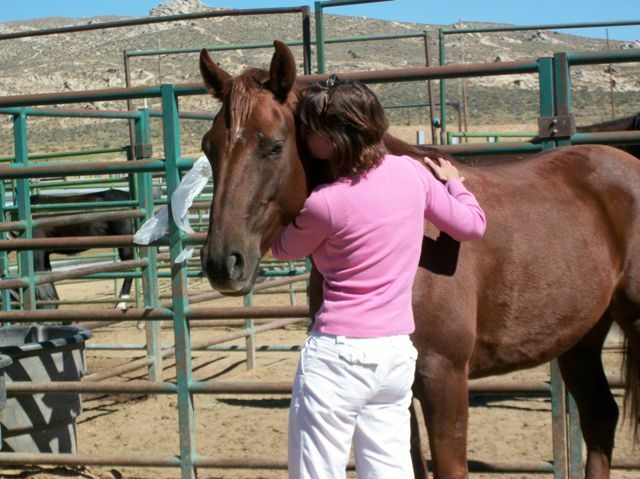 All of our horses are wonderful, but finding ones that touch your soul in that special way is such a gift. I’m sure Jesus is happy to see his boy got such a loving home. How did you not come home with all of them?? PS I loved Zorro and Bubba Lou. Hope they got a home. What happens to the ones nobody bids on? Thank You Jesus for working with these horses. Your awesome. Thank you Dawn for adopting. 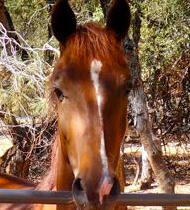 Rojo has a very kind trusting face. Looking foward to hearing more about this new partnership. Wow what a good post and congratulations to you and beautiful Rojo!!! That picture of you and Rojo brought a tear to my eye. Looks like the beginning of a wonderful relationship and he looks so much like Aladdin! Yes, congratulations! I don’t worry about Finn. Not sure that you guys click. However, I hope that you will get involved w/ a trainer because all this will be a new world for this new horse, who is used to a wilder life. His world that he has grown to know is going to change radically. Honestly, please don’t think about him “looking like Alladin.” He isn’t Alladin. He is himself and you must get to know him. That is why I think a trainer could really help you get off to a good start. Have a trainer there the first time you ride him so he doesn’t pick up any bad habits. 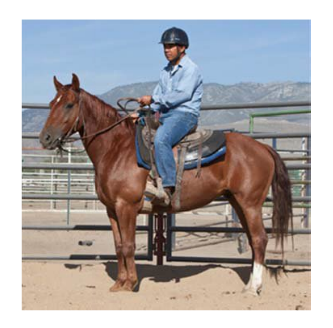 His original “tamer” and trainer is obviously a good confident person, and that is what this horse understands. He is a survivor, and if you don’t show leadership, he may show it, and you don’t want that. Good luck! 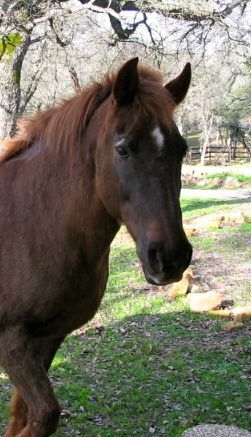 But remember, he isn’t Alladin, he is formerly wild mustang who needs leadership. I’m not being negative here, just realistic. 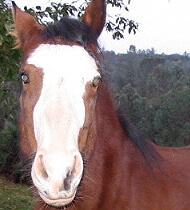 I am excited for you but just realistic about horsey nature. Congratulations! My he looks like Aladdin:) Love reading your blog and love what you do with your bucket fund. Again, congratulations, Poco Rojo is a lucky boy and I look forward to reading about your adventures together. 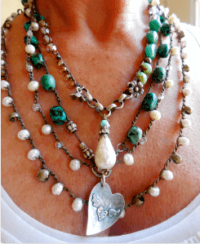 Once you started writing about these auctions, and attending, I knew it was just a matter of time before I read that you had secured one for yourself. He is LOVELY! I am SO Happy for you! I love your posts on the prison mustangs (who am I kidding, I love your entire blog) and I’m so happy one found a home with you. I was all teared up reading this today – CONGRATULATIONS! I cannot wait to hear more about him as you get to know each other. Good for you! Had a feeling there’d be at least one you couldn’t resist. Handsome boy, and so relaxed in his new Mom’s embrace. Looking forward to “The Adventures of Dawn and Poco”. Happy trails!!! 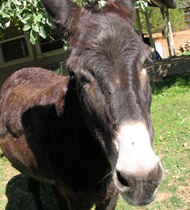 BTW, did anyone adopt the burro? Congratulations on a great horse!!! I’m so happy for you. He looks like a wonderful new family member.